Clean Streets: The four members of the Donnas developed in a very unpunk environment--the tony peninsula city of Palo Alto. Can the next great rock band really be from Palo Alto? Rock & roll is supposed to be the province of rebels and social outcasts, a way for the socially or economically oppressed to make good. There's a very good reason that Elvis came from Tupelo, that Bruce escaped from Jersey, that Nirvana fled rural Washington--and that's partly why their music is so very powerful. Given that dictum, the city of Palo Alto would not seem like a very good breeding ground for a punk band. Nevertheless, it is the birthplace of the Bay Area's latest rock sensation: the Donnas. The Donnas are an all-girl band whose members average just 18 years of age. In the three years since the band formed, it has achieved an amazing level of success, releasing two full-length albums, playing sold-out shows at local clubs in the Bay Area and even touring Japan. Most importantly, however, the Donnas have garnered a remarkable amount of good press, including a rave in the LA Weekly that gushed, "They play and shriek with the abandon of a gang of liquored-up girls in bumper cars on the last day of school." Indeed, the Donnas have done so well that rather than break up, as they planned to do when they graduated from Palo Alto High School last June, they are continuing on as a band of college co-eds--albeit ones who are taking a semester off from their respective universities in order to go on a national tour. Their first record, The Donnas, came out on the tiny Superteem! label, but their latest, American Teenage Rock 'n' Roll Machine, which arrives this month, is on Lookout!, the larger, East Bay-based independent label responsible for bringing the world another teenage band called Green Day. In fact, the Donnas have more in common with Green Day than just their youth. Like Green Day's, their music is somewhat derivative. "Retro" is a harsh word to level at anyone so young, but both the Donnas' look and their sound recall other eras. The girls' tight, French-cut T-shirts emblazoned with the glittery press-on word "Donna" evoke both the Runaways and Laverne's sweaters from Laverne and Shirley. And their music, though sometimes likened to that of the Ramones, also resembles that of the Runaways, an all-girl band of 16-year-olds who created a sensation in 1976, four years before singer Donna A (Brett Anderson), bassist Donna F (Maya Ford), guitarist Donna R (Allison Robertson) and drummer Donna C (Torry Castellano) were even born. As did the Runaways, the Donnas like to play with the dichotomy between their innocent looks and their slightly naughty lyrics on such provocatively titled songs as "I Want to Be a Unabomber" and "Leather on Leather." The Runaways were the brainstorm of a producer named Kim Fowley; similarly, the Donnas are the creation of Darren Raffaelli, owner of the Superteem! label. 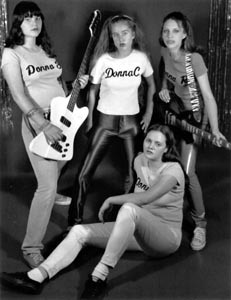 Originally, the Donnas--who met in junior high school--were called the Electrocutes, mostly played covers and wore whatever they liked on stage. It wasn't until Raffaelli turned them into Donnas that the concept of a band that was half Shirelles and half Ramones really caught on. Perhaps the sense that there was (Raffaelli has since drifted out of the picture) a Svengali in the background is one reason that the Donnas' work does not yet quite ring true. An air of "novelty band" surrounds their performances. The fact that they can play their instruments at all seems to delight and astonish their audiences, and that's ridiculous, for why shouldn't they be able to play their instruments? Why shouldn't they be representative of a time when teenage girls can do anything they want to, in public, for fun, without alienating or shocking any part of the status quo? IT'S A DIFFERENT world for budding female rock stars now. Unlike Janis Joplin, Patti Smith or even Pat Benatar, the Donnas exude a high-caste social standing, and this may well be part of their appeal. Another misconception that dogs the Donnas is the idea that they are, to quote the LA Weekly piece, "cheeba-smoking, troublemaking girls" who've found solace and a community of like-minded rebels via the making of their band. That may have been true of Green Day; it was definitely true of the Runaways, the Ramones and many of the men who write articles about rock, but these days, kids who form rock bands aren't necessarily loners, nor are their parents necessarily appalled by their antics. Thanks to the pervasively non-outsider nature of rock & roll now, the Donnas are far from the outcasts that being in a punk rock band used to require by law. Instead, they are upper-middle-class white girls whose parents can afford to buy them guitars and amps and music lessons. Of course, these days this is true of many bands: Courtney Love, for example, is the Bausch and Lomb heir in addition to the widow of a man whose estate provides a fortune. The Donnas' insider status should not be held against them, but it also should not be forgotten because it's integral to who they are and what they sound like. That's OK for now, but I hope that in the future the Donnas learn that they don't have to live out--or up to--someone else's rock & roll dream; they can afford to make up one of their own. From the January 1998 issue of the Metropolitan.